This is a crisp savoury snack. the combination of spicy miso oil and mozzarella cheese is absolutely delicious and addictive. Easy to make and eat. I found a perfect snack for beer! Place the dry yeast and sugar in a bowl, mix in 120ml lukewarm water. Set aside in a warm place for 5 minutes, until bubbles appear on the surface. Place the flour, salt and olive oil in a different bowl, add the yeast mixture and mix together. Transfer the dough to a floured surface board and knead for about 5 minutes. Make the dough into a ball, place on a floured tray under a clean, dump cloth and set aside in a warm place for 40 minutes. To make the spicy miso oil, place the miso, oil, honey, minced garlic and chili flakes in a bowl and mix until well combined. 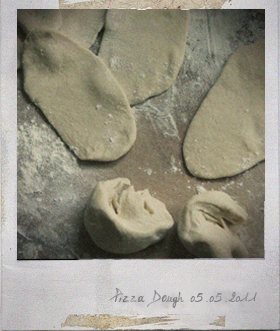 Divide the pizza dough into 10 balls and roll out on a floured surface board to ovals. Brush the baking tray with olive oil and lay the oval bases on the tray. Spread the spicy miso oil and top with grated mozzarella. Bake in a preheated 220C/425F oven for about 8 minutes until topping is golden and the base is crispy. 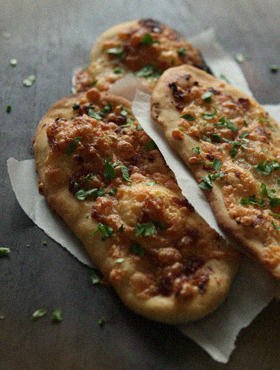 You are currently reading Spicy Miso & Cheese Pizza Bread at Fish Trip Cafe.